PYO UK Tour 2016 CD release! Join Palmusic UK Guardians circle! In Summer 2017, Palmusic UK in association with Amos Trust presented the Galilee Quartet in concerts in London and Oxford to launch the Just Walk to Jerusalem project. 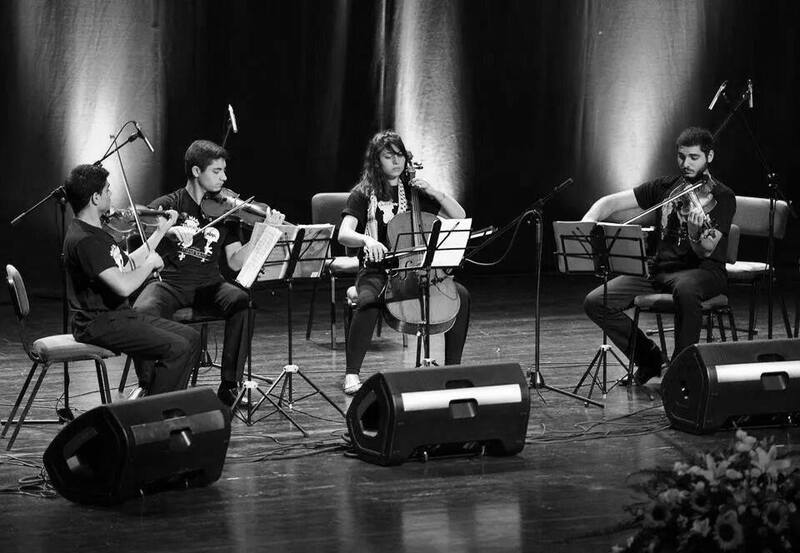 Following their monumental UK Tour with the Palestine Youth Orchestra last summer, the four young musicians from Galilee returned to the UK with their family quartet for two special concerts in London (4th June) and Oxford (6th June). The Saad brothers, Omar (viola), Mostafa (violin) and Gandhi (violin), shot to international prominence at the 2013 BBC Proms, appearing with Nigel Kennedy and the Palestine Strings, and winning the hearts of audience and critics alike. Their 18-year old cellist sister Tibah completes the Galilee Quartet, which has been praised for its richly diverse and soulful programme of Oriental and Western music for strings and voices.With charismatic flair and poise, these dynamic teenage musicians from Meghar village, near Nazareth, performed an exciting music programme at St James’s Piccadilly Church in London an at St Margaret’s Church in Oxford, featuring music by Beethoven, Fairuz, Mohammed Abdel Wahab as well as their own compositions. In London, the Quartet was joined by the Palestinian jazz and Arabic singer Maya Khaldi. Omar and Tibah were awarded partial scholarships to study at the Royal Conservatoire of Scotland after the Head of Strings met the two talented students while they were rehearsing with the Palestine Youth Orchestra in summer 2016. The concerts enabled the young musicians to raise the remaining funds and start their University Degrees in Glasgow in September 2017. We would like to thank everyone who came to the concerts and supported the young musicians.